The 8 Best French Restaurants in West Virginia! You don’t have to travel to France to enjoy authentic French cuisine. Sprinkled throughout the Mountain State are hidden gems that will tantalize your taste buds with European flavors. Chefs specializing in haute cuisine and culinary techniques representative of France will prepare fresh and locally-sourced food to delight diners with delicious delicacies deserving of distinction. Visit any of the bistros, cafes, or restaurants below for an experience you won’t forget. Provence Market in Bridgeport, West Virginia, is a unique oasis in the Appalachians. This little French provincial bistro gets high marks on social media for outstanding food, excellent service, and reasonable prices. In good weather, dinner can be enjoyed on the deck overlooking the water, but inside provides a very comfortable ambiance as well. If you have a taste for superb French-inspired food, you won’t go wrong here. Their wine selection has consistently won the Award of Excellence from Wine Spectator Magazine for the past 12 years. The crab brulée is highly recommended. This is fine dining at its best. Open Wednesday through Sunday, the French Goat is in the heart of historic Lewisburg, West Virginia. With an outstanding wine list and specialty cocktails that complement the menu, the owners are strict believers in supporting the community by using locally-grown food. Whether you want a small, intimate place for a romantic dinner for two, or a location that can accommodate small parties, the French Goat offers both. They have several choices of Charcuterie plates features cheeses, pates, meats, and more, but their appetizer list is delicious with items like foie gras seche, a seared foie gras, orange-scented French toast, macerated strawberries maple syrup, and chicken jus. Entrees include delicacies like petoncles et risotto, scallops with lemon risotto, broccolini, citrus supremes, and a warm tomato vinaigrette. Elegance never tasted so good. Located in the Clarion Hotel Morgan in downtown Morgantown, West Virginia, the Montmartre will be an unforgettable experience. From the beautiful view on the rooftop terrace to the decorations with rich reds, dark woods, and gold hues in the Grand Ballroom, diners can choose entrees like the popular Montmartre crab cakes served with a roasted red pepper remoulade or Steak Luann, a filet mignon topped with crab and béarnaise sauce. the Montmartre has been the premiere wedding destination for nearly 100 years. Offering one of the best wine selections in the area, and the best of contemporary French cuisine, Le Bistro in Huntington, West Virginia, allows you to experience artistically prepared foods every day except Sunday. They offer a special brunch on Saturdays that features French comfort food like crab cakes with poached eggs and hollandaise sauce, strawberry French toast on brioche with maple syrup and bacon, poached pears, shrimp and grits, and more. Diners will enjoy the crystal chandeliers overhead, the beautiful artwork displayed throughout the restaurant, and the open kitchen where expert chefs prepare their food. You don’t have to travel to Paris to enjoy authentic French food at its best. Stop by Bistro 112 in Shepherdstown, West Virginia, and experience the environment locally. Created to celebrate and share her memories of living in France, owner Deb Tucker brings atmosphere, locally sourced food, and drink together for others at affordable prices. Featured many times over the years in publications like Budget Travel, the DC Spotlight newspaper, and Around the Panhandle, and winner of numerous culinary awards, Bistro 112 serves delicious appetizers like pate du campagne, house-made pate with peach chutney and cornichon pickles served on crostini and entrees like L ’entrecote au poivre, a French-style grilled steak with special peppercorn sauce served with pomme frites. And how could you resist tempting desserts like crème brulée or chocolate mousse? Imagine being seated in a quaint historic building overlooking the river while enjoying a fine French chardonnay or cabernet sauvignon and deliciously prepared escargot with that special someone. That’s what you’ll experience at Laury’s Restaurant in Charleston, West Virginia. You and your guest can then move on to French onion soup prepared with smoked mozzarella cheese, and a surprisingly light salad made with fresh spinach, apples, raisins, pistachios, and a gorgonzola pear dressing. 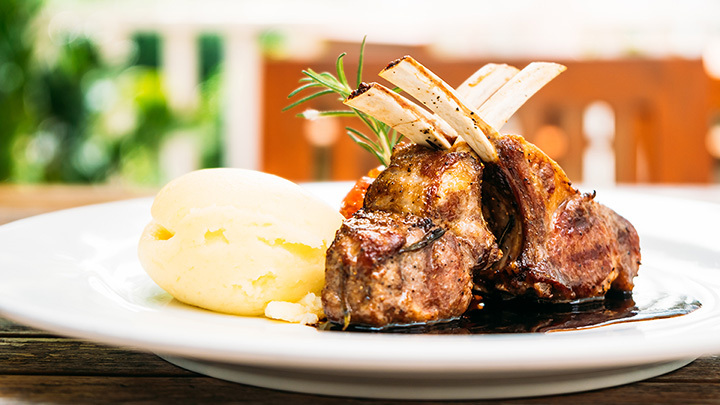 Your entrée could be rack of lamb with a demi-glace sauce and lemon-mint salsa verde or a petite filet mignon, served with a black and white truffle butter veal reduction, each served with creamy whipped Yukon Gold potatoes. If you have room for dessert, you might want to try the Grand Mariner or chocolate soufflé. You’ll go home happy. Known as one of Charleston’s fine dining restaurants and romantic culinary destinations, the French Quarter Restaurant, located in Mardi Gras Casino provides a unique and unforgettable experience. If you want a special location to celebrate an anniversary, birthday, or other important event, this is the place. Trained chefs will prepare your meal to order. If you’re a steak aficionado, you can enjoy a filet mignon, New York strip, or prime rib dinner that includes salad, baked potato, and seasonal vegetables. If seafood is more to your liking, visit the restaurant on Friday for the all-you-can-eat Seafood Extravaganza. Other weekly specials are available, but reservations are strongly encouraged. Offering specialties that represent France, Spain, Italy, Greece, Lebanon, and Morocco, Alfredo’s Mediterranean Grille & Steakhouse in Charles Town, West Virginia has been serving delicious international foods for over 10 years. Located in the beautiful and historic downtown, this quaint family owned multi-cultural restaurant is open for lunch and dinner and has a great selection of international wine and beer. Recommendations for those preferring authentic French cuisine would be their French onion soup for starters, then crevettes a l’aneth, succulent shrimp sautéed in a dill sauce and served over rice or pasta, or pollo al ajillo, chicken marinated with lemon, garlic, and white wine and served over your choice of rice or pasta. They also make special food allowances for guests with dietary needs. Reservations are highly recommended due to their popularity.